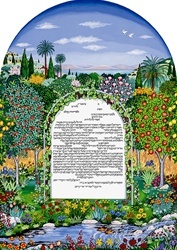 Naomi Teplow has produced this magnificent ketubah which measures 151/2" x 22." 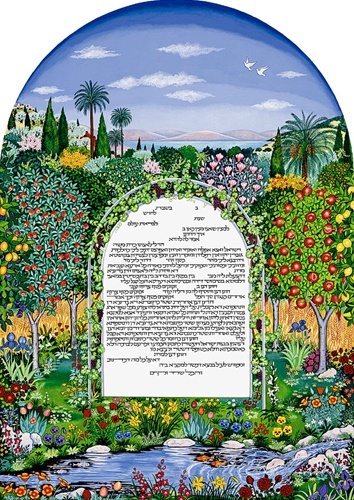 In The Four Seasons Ketubah, one is invited into a 'Sukkat Shalom', a Shelter of Peace, where the grapevine alludes to the day when "every man shall sit under his vine and fig tree" and "they shall beat their swords into plowshares", as our Prophets say. Around this sukkah are trees in full bloom side by side with trees in fall leaves and in full fruit of both summer and winter. These trees represent the cycle of time and the flow of the seasons, in which the marriage, the home and the family stand steadfast, surrounded by the joy and beauty of Nature. The apple tree suggests a "taste of the Garden of Eden" and the Seven Species of Israel bring blessings of abundance and richness. The water suggests the flow of life, and its renewal, and the fish -- fruitfulness. Here, too, Jerusalem looms in the distance and the two doves, along with the olive trees, the fig trees and the vines suggest Peace and Love.